I am trying out HikaShop Starter 1.3.6 with Joomla 1.5.22. The install was too easy, very nice! And the set-up has gone well. However, when I test the checkout function, the user is never asked for their credit card information. My only payment option is the authorize.net plug-in. After pressing NEXT twice, the system jumps to sending to Authorize.net which generate an error (see below). The "sale" is saved fine, as are the email notifications sent. Has anyone else run into this issue? My second issue is that authorize.net error. It's error #14, complaining about my lack of a return url entered. What I can read about this subject, the general advice out there is that that field in my Authorize.net setup at Authorize.net should always be blank (not set). Which is good for me, as I use that account for more than one website. Any ideas on a fix. My final question is more of a feature request, and to see if there is a work-around available. I need to capture information from the customer by product, so just adding fields to the address table would not be an ideal solution. We sell extended warranties, and need to capture the Brand Name, Model Number, Serial Number and Product Type on each product sale. A single customer buying more than one product would need to enter different information for each product. I would settle for a input text field. Any suggestions? For the authorize.net error 14 : Please go to System->Payment methods and edit the authorize.net plugin. There activate the payment notification option and save. That should solve the problem. The authorize.net plugin uses the AIM API. With this API, the payment is done on the authorize.net website and not on your website. So it's normal that you're not asked for your credit card number before the end of the order as the payment is done once you're redirected to authorize. We have custom fields on the order itself (on the business version) so that you can ask information related to each order. Would that meet your needs ? I went into the authorize.net plug-in and the payment notification was already enabled. When I tested it again, I did get a new screen (new to me), that stated I was being transfered to the authorize.net site to complete the transaction. FYI, this came up immediately after clicking Proceed to Checkout and login, then straight to the above screen, no shopping cart display or options. The following errors have occurred. (14) The referrer, relay response or receipt link URL is invalid. The end user gets an email that states: Your order will be processed as soon as we receive your payment. On the custom fields in the business version, yes that will work IF it allows the user to input text, I can't predefine all possible serial numbers into a table. Does it allow for an input field, or can I add some PHP code, any available fields at the order line level? Log into your Authorize.net account and go to Settings -> Response/Receipt URLs. Make sure that you delete any specified URLs. There shouldn't be any defined response / receipt URLs. Otherwise it might conflict with the one hikashop is sending to authorize. Alternaively, you could try to add the URL http://your_website.com/index.php?option=com_hikashop&ctrl=checkout&task=notify¬if_payment=authorize&tmpl=component as the relay (response ?) URL in your Authorize.net account. Yes, you can define a texte area as custom field for orders. You will have the same custom fields possibilities but they will be linked to orders and not to addresses. HI and Thanks again for the speed of these replies! I had to add the URL to my authorize.net configuration, but once I did the shopping cart and then the transaction screen did appear and had all the correct information. Yea, progress! first it showed to be in TEST MODE, is that because I have debug enabled? How do I turn test off? The following errors have occurred. (13) The merchant login ID or password is invalid or the account is inactive. Yet, that the same valid login and password I have always used. Odd. Any Thoughts? This error occurred when I clicked the link to return to the site. Finally, the shop shows the order now in confirmed status (that's my first! ), yet I don't see the transaction on Authorize.net, so I guess test mode really is on for this test, but I know for a fact my account status is "Live Mode". As for my other question, text input field(s) would work fine, I would prefer it at the order line level, but am excited to hear it does exist at the order level! So that's the business version with that feature, correct? Is there a limit to how many custom fields can be added to an order? This was great news to hear! In the same screen where you checked the notification option (menu System->Payment methods, then click on the authorize plugin), you have the option debug that should be turned off. Please check that. For the custom fields, there is no limit for the number of custom fields. And yes, the custom fields on the order are indeed available in the Business edition. Worked! Problems Solved. Thank you very much for your help. 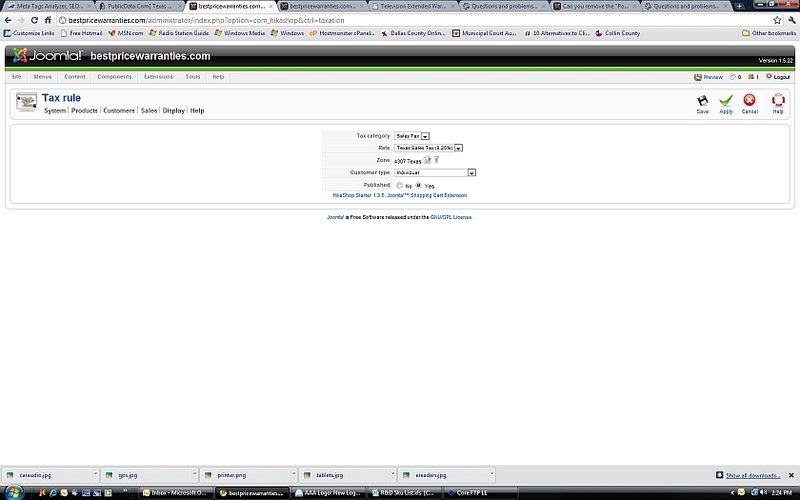 When I added the URL to my authorize.net account, the transaction screen started working fine. When I cleared the debug, the test mode went away. When I clear the return URL entry out of the authorize.net URL plug-in the error messages stopped. Now I am trying to figure out exactly how to setup sales tax for Texas, USA customers only. My real test purchases should have had tax added, but they didn't. I have the tax defined in HikaShop, as my only tax category, which all products have selected. It's limited to just USA=>Texas in the Zone field. Is that correct? The authorize.net receipt email shows me as tax exempt. Could you do a screenshot of your taxation rules ? The taxes will be applied automatically based on the billing/shipping address of the customer. It will depend on the zone restriction you set but also the customer type, the product tax category and whether or not the tax rule is published. Customer Type? Had not tried that.. my test are being done with the admin account. Here is the screen shot. So when you checkout, you should not fill the company field if any (otherwise the system will consider you as a company and since you limit the tax on individual the tax won't be applied). Also, you should make sure that in the configuration under the main tab, the option default customer type is set to individual. Also, you're limiting your tax to texas. The tax will be applied in your store if you set the "main tax zone" in the configuration to texas. Then, once the user is logged in and that an address is selected on the checkout, the state entered in the address will be used instead of the main tax zone. So when you order on your website, if you don't put an address within the texas, the system won't add the tax. Last edit: 8 years 4 months ago by nicolas. OK, I follow your logic and will make the adjustments. I truly appreciate your help today.